The Gosa is a common blessing ritual that can easily be performed by people themselves, without the need of a Mudang. It contains many of the typical shamanist features, such as various food and alcohol offerings, burning incense, bowing, and especially the central place of a pig's head offering. It is commonly performed for a new car, or a new truck for a small business owner, and it is also performed for opening a new business, beginning a construction project, or in the film and TV industry at the beginning of a new production season. Here are a couple of short media articles that describe a Gosa ceremony. "Glimpse of Korean Culture - Gosa"
You have probably come across an array of boiled pig heads on display at street vendors in traditional markets such as Namdaemun. Those pig heads are mostly purchased by people who are launching their own business, starting a business-related project, moving into a new house or buying a new car. The more smiley the pig is the better, the traditional saying goes. The cost ranges between 10,000 won ($8.84) and 30,000 won depending on the quality. Then the heads are placed on the table along with many different kinds of dishes from sirutteok (layered sticky rice cake made of adzuki beans) to dried pollack, steamed rice, jjeon (Korean pancakes), pears, apples and chestnuts as well as alcoholic drinks including makgeolli (fermented rice beer) and soju. 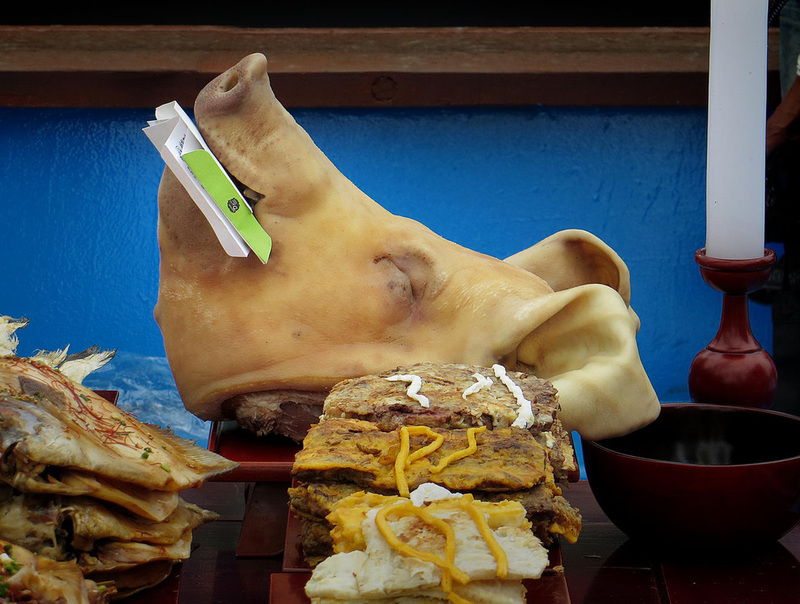 Visitors stick cash - in multiples of 10,000 won - they have prepared into the mouth and ears of the pig head. (The cash goes to the host of the event.) Then they kneel down and bow to the table. Some people choose not to bow due to religious reasons. When the ritual is over, the visitors eat and drink together. The pig head is also sliced and eaten with fermented baby shrimp. The whole process is called gosa in Korean, which refers to a shamanistic ritual intended to prevent misfortune and bring good luck. As the superstition goes out of fashion, with the modernization of Korean society, fewer people in the past decades hold the gosa ritual when they move to a new house. The rice cake with adzuki beans is used for the ritual because the color of the grains is traditionally known to expel evil spirits. 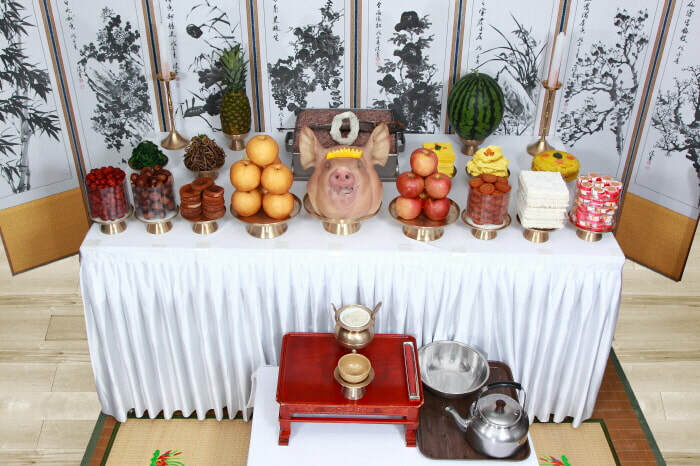 For Koreans, pigs represent money and fertility. The reason the animal is associated with money is that the Chinese character meaning pig reads don, which also means “money” in Korean. Also, pigs are known to be able to breed up to 15 at a time. That is why when pigs appear in dreams, people take it as a sign of good luck and go buy a lottery ticket. Despite the long-held tradition, an increasing number of Koreans find it unpleasant to see an amputated head of an animal. Some have begun to replace it with a sugar-coated cake resembling a pig’s head. "A Gosa Ceremony at POSTECH"
On March 17, Haeoreumsik, the annual Gosa ceremony hosted by the Student Union, was held at Atlas Hall at lunch time. Eight student bodies including the Student Union gathered and displayed their panels for advertisement.